Quality at its best. Free wi-fi, leather seats as standard (some extra buses may not have leather seats), USB & plug sockets and new folding tables! Real time bus information (including next stop information) ensures you don't need to worry about your journey. Modern, low floor buses shuttle you between Heathrow Airport and Berkshire, Surrey and Hertfordshire. Some of these buses are hybrid or gas buses, thus they impact less on the environment. Easy ticketing through the L'Card, accepted on all of our out-of-London services. From 2nd November 2019, exciting new changes are coming to the Heathrow 7series. Buses operate from our Heathrow North Garage, except non-L1/Group journeys on the X74, some journeys on the 72 which are from our Bracknell Garage and some journeys on the 174 which are from our Hemel Hempstead Garage. 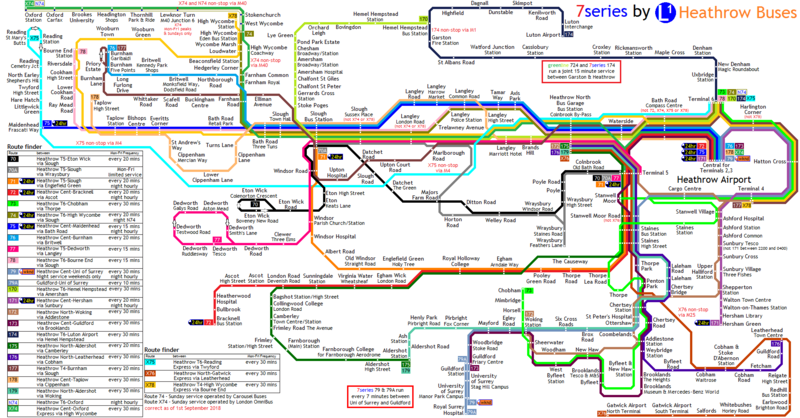 Discovery tickets are accepted on the whole 7series network, except for between High Wycombe & Oxford on X74/N74. Intalink Explorer tickets are accepted on the whole of Routes 74, 75, 78, 170, X74, X78, certain N74 journeys, Route 174 between Uxbridge and Luton Airport.